Your body has charged particles known as electrolytes. Examples of electrolytes include sodium, potassium, calcium, magnesium, and phosphorus. These electrolytes are responsible for maintaining fluid balance in the body, and their electrical charge helps produce energy in the body. You can lose electrolytes via water in your body — from excess sweating, injuries like burns, blood loss, or illnesses like diarrhea and vomiting that result in water loss. If this occurs, the best way to increase electrolytes is via foods and beverages. If you are exercising, electrolyte imbalance occurs when you sweat. Replenishing electrolytes helps your body maintain plasma volume, which is depleted by sweat. Drink a sports beverage that contains potassium and sodium. Look for a sports drink with 14 to 16 g of carbohydrates. This will help boost your electrolyte levels and your overall energy levels. The carbohydrates also help your body better absorb the fluid and electrolytes. Eat a gel with sodium and magnesium, the two electrolytes usually lost in the body during exercise. 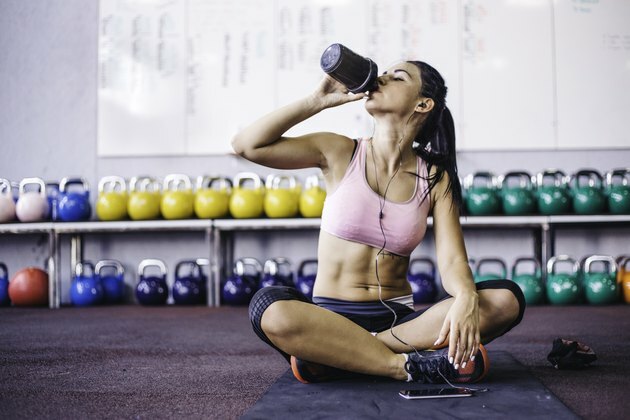 Chloride, potassium and calcium also have electrolytes, but if you're exercising and losing electrolytes, your body is usually short on sodium and magnesium. Carry some gels with you during a long run or bike ride, particularly if it's hot or humid weather. Some athletes also carry electrolyte tablets, which can be taken alone or dissolved in liquid. Eat 8 ounces of yogurt and a can of chicken noodle or other canned soup. These two foods can be easy on your stomach after a long exercise routine or illness, and they contain potassium and sodium, two of the chief electrolytes your body needs. Eat a meal containing salt. If you eat pasta with a salty topping, you are giving yourself the carbs you need along with the extra sodium to help maintain electrolytes. While you shouldn’t go overboard on the salt, adding a few shakes to a pasta dish like vegetable lasagna or spaghetti can help incorporate electrolytes into your diet. Drink or eat a dairy product. Calcium and phosphorous are sources of electrolytes in your body, and can be found in calcium-containing foods. Try cheese, yogurt or milk. Consume food sources of magnesium, an electrolyte needed to contract and relax your muscles. Examples include dark, leafy green vegetables like spinach and kale. Additional food sources include bananas, almonds, seeds, tofu, brown rice, millet, dried apricots and avocados. You'll know when you're low on electrolytes. Your muscles will feel weak. They may twitch and cramp, to the point that you'll need to stop your activity and stretch. You may feel lethargic. You may even feel a bit confused. If you're exercising heavily in the heat, and feel these symptoms, you need to stop and re-orient yourself. Get inside, or under some shade, eat a gel or sip an electrolyte-filled drink slowly. Make sure you're feeling like yourself before re-starting your activity. Your body needs to restore the electrolytes it has lost. If you're cramping, stretch until you feel the cramps dissipate. Muscle cramping will feel terrible, but doesn't pose a serious medical problem. If you're feeling lethargic and confused, these could point to more severe problems, and you stop your activity immediately and consume some electrolytes. Muscle weakness, fatigue and difficulty concentrating could indicate your body is low in electrolytes. If you have been severely ill or injured, foods and fluids alone may not be enough to replace lost electrolytes in your body. See your physician if you experience severe illness or injury. Electrolyte imbalances can indicate an underlying medical condition, such as kidney disease. Good electrolyte balance keeps the heart beating, the kidneys filtering, the intestines excreting, and the brain working.